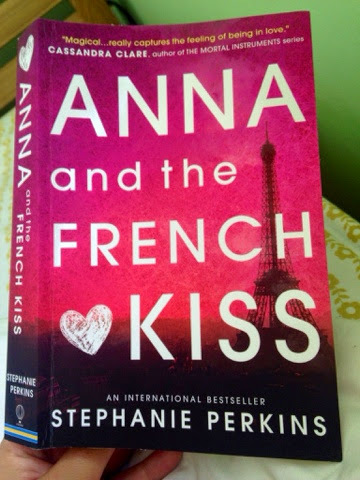 Anna is sent to Paris to study for a year before she goes off to college- the city of lights renowned for romance and love, but Anna doesn't see it like that. Anna is resentful and angry to be leaving behind best friend Bridgette and heart throb of the moment- Toph (a ridiculous nickname for Christopher). Anna arrives in a foreign city, knowing no more that Oui and Merci, but she soon finds her place amongst a group of friends- Meredith, Josh, Rashmi and of course, Etienne St Clair- a British...French...American...oh who knows...boy who goes by his last name and manages to capture the heart of homesick Anna despite a considerable lack in the height department- a feature that is brought up many a time throughout the book. I liked Anna from the word go, she was feisty yet innocent and everything that I would expect of a teenage girl. I liked that she had a good sense of humour and she held her own again the boys when it would have been easy to write a female character without a backbone. Sadly I felt as though she lost this in the later part of the book as her whole being came to be about her obsession with St Clair. I felt as though I lost the Anna that I had so enjoyed reading about and I didn't like how she turned from strong and feisty to weak and lovesick within a matter of pages, I don't think that it was necessary for Anna to turn in to what is arguably a stereotypical girl in love, I would have liked it if Anna could have subverted the stereotype. I also couldn't stand how she started to refer to St Clair by his first name, I understand the intention but it just made me cringe. At first I wanted to dislike St Claire- I mean who goes by their surname? To me it came across as a bit pretentious but I warmed to him very quickly despite it. All the characters had good humour and many of them stood out in their own right. I believed that Anna loved St Clair and I believed he loved her too. The only part that fell short for me was Anna's obsession with Toph, I didn't really believe it and therefore I found it hard to sympathise when she encountered difficulties with her 'relationship' with him. Overall I really did enjoy the book, I devoured it within a couple of hours and that is always a sign of a good book. Also despite the odd occasion where the characters made me squirm with embarrassment, I have come to the conclusion that teen life and teen love is all about embarrassing yourself and a good teen romance wouldn't be complete without a few cringe inducing moments! The book is full of angst and drama but isn't that what teen life is all about?